(Bloomberg Opinion) -- Stop worrying about China’s ban on Australian coal. A Reuters report Thursday that the northern port of Dalian had banned imports from China’s biggest supplier of the black stuff sent ripples through global markets, driving the Australian dollar down as much as 1.3 percent after a whipsawing day of trade. London-listed shares in Glencore Plc, Anglo American Plc and BHP Group fell 3.2 percent, 1.5 percent and 2 percent respectively. The obvious fear is that Canberra’s increasingly rocky relationship with Beijing could be prompting more widespread import curbs, not unlike China’s brake on U.S. agricultural exports since the trade war began. For Australia, which counts China as its biggest trading partner, that could be devastating. It’s an alarming narrative, but doesn’t quite hang together. First, consider the source of the reports. Dalian is a major center for commodities trading, yet as a coal import harbor it’s not particularly significant. On its own, it doesn’t even make it into China’s top 10, according to GlobalPorts data. Throw in the four other ports which, according to Reuters’s reporting, are affected by the ban, and you have a more significant complex – but it still trails the key trade channels along the southern coast of Shandong; near Shanghai; and along the country's south coast in volume terms. Then there’s the fact that China can’t easily hurt Australian coal exporters without inflicting pain at home. Dalian disproportionately handles coking coal, an essential raw material for steelmaking, one of the biggest sectors in the surrounding Liaoning province. Steel mills are notoriously fussy about the type of coke they use, and China’s domestic industry is only just recovering from a spike in prices toward the end of last year. Along with weaker prices for steel, that rise took many factories to the edge of profitability. Replacements for Australian coal will be hard to find domestically, Yu Zhai, a senior consultant for Wood Mackenzie, wrote Thursday; prices for low-sulfur premium product from domestic mines would have to rise as mills scramble to substitute imported tons, he added. In truth, China has been trying to ease its coal imports for some time now, in an attempt to source less from overseas as it restructures its domestic mining industry. Unloadings in December fell by more than half from the same month of 2017 to just 10.23 million metric tons. That’s the smallest monthly figure in nearly eight years and the biggest fall from a year earlier in data going back to 2006. Even if you smooth out monthly volatility with a moving three-month total, the country looks to have been retrenching coal imports at a pace consistent with the industrial downturn of 2015. 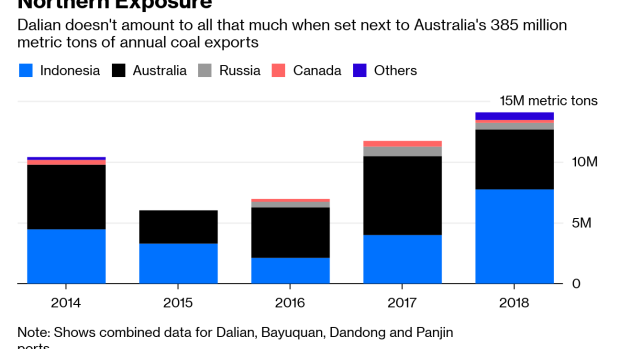 That fits more consistently with the picture painted by earlier reports that China is delaying customs clearance of Australian coal imports, rather than banning it outright. The moves may as much be about Beijing’s environmental drive and desire to improve profits in its domestic coal industry, Reserve Bank of Australia governor Philip Lowe told a parliamentary committee Friday. To be sure, there are plenty of irritants in the relationship between Australia and China at present. Canberra this month removed residency rights from Huang Xiangmo, a property developer and major political donor. Intelligence officials have linked Huang to the Communist Party, according to Australian Broadcasting Corp. Beijing has also warned that reports China was behind a cyberattack on Australia’s parliament would “poison the atmosphere for cooperation” between the two countries. Even so, the more likely explanation for the current kerfuffle is that some Chinese officials are seeking to link a more humdrum shift in industrial policy to geopolitical considerations to keep its trading partners nervous. If China really wanted to hurt Australia, it would crack down on visas for local students wanting to study there – a business that’s worth roughly the same amount of export dollars as coal. Mainland students could just as easily find substitute university courses in Europe, North America and elsewhere. It’s only natural that Beijing wants to keep its partners worried about poking the bear – but in this case, the sleeping animal is more of a panda than a grizzly.